An Electric Bike is a fantastic way to reduce your Carbon Footprint and to be Green. They are also great fun and mean you can enjoy that outdoor freedom, that a bike gives you, but without arriving at your destination sweaty and tired. If you like riding, but are finding the hills are not so fun, or you need to travel further than you are comfortable pedaling, then you can let the Electric Motor take the strain on an Electric Bike. However, an Electric Bike is only as good as its weakest link, so a suitably rated, reliable and safe E-Bike Battery is key. We all know that an e-bike has an e-bike battery to provide energy to the rest of the system, but do you understand what Volts, Capacity, Power, Energy and all the rest of those confusing numbers and terms really mean? Some people will say that an e-bike battery is the same as a laptop battery or mobile phone battery and in a sense, they share many similarities. But there are also differences and you should remember that the total energy within an e-bike battery is far greater than you would find in any personal device. So, what are the basic components/parts that make up an ebike battery? E-bike batteries are made up of numerous cells, typically 3.6V, 2-3.5Ah each (don’t worry we will explain this terms in a while ?) and there may be 30, 40, 50 or more of these cells in a typical e-bike battery, that are combined in series and parallel to meet the total voltage, capacity and power requirements requirements. The BMS that sits between the combined cells and the outside World. The BMS protects the cells (also external components) from damage and maintains the cells, so that they can work together in an optimum way and safe way for the long term. A lithium ion cell has a safe working voltage range that every cell must stay within. If either the upper or lower voltage limits are exceeded, the effected cell/cells can be permanently damaged and could even result in a dangerous situation. It is the job of the BMS to keep the cells working within the normal working range and this is achieved by disconnecting the charger if any cell within the battery exceeds the High Voltage Cut (HVC) and by disconnecting the load (motor controller in this case) from the battery, if any cell within the battery hits the Low Voltage Cut (LVC). The BMS will also have protection against excessive discharge current (over-current), which could be due to using an excessively powerful Motor System with an inadequate battery, or to protect against a short-circuit condition (such as a damaged cable, or faulty external component). A similar principle will also be applied for charging, and there will be some form of over-current protection for charging. In addition to the above, there will also typically be some form of balancing function on the BMS. Balancing a battery, means to reduce any variations in the cell voltages. By doing this, the cells are working together, so you can obtain the maximum possible capacity, as well as to avoid any cells within the pack reaching the HVC, or LVC voltages before the others in the battery (as this may prematurely age those cells). There may also be some form of temperature sensing to halt the charge, or discharge, if the battery exceeds the safe operating temperature and a low temperature limit, that may prevent the battery from being charged if the battery is excessively cold. There may also be other functionality available on high tech BMSs, such as being able to communicate battery data to your phone or to provide diagnostic data remotely in the event of an issue. Here at EM3ev, we are moving towards high tech, programmable Smart BMSs, that will link to your phone to provide useful battery data, as well as indicators of the batteries state of health. Lead Acid Batteries: Lead Acid Batteries are cheap and they are also recyclable, but that is largely where the pros end. The cons of ebike batteries are a heavy weight with relatively low capacity (low energy density), so by the time you have enough capacity to meet your requirements, the weight is excessive. Lead Acid batteries also have a short lifecycle, so you might need to replace that set of batteries in a matter of only months. Lead Acid Batteries are still commonly used in low cost ebikes or e-scooters. Nickel-Cadmium Batteries: Nickel-cadmium (NiCd) e-bike batteries have higher capacity than lead-acid batteries and they also last longer. However, these batteries are more expensive than the Lead Acid. They contain rather polluting chemicals and have a memory effect and so require special maintenance procedures and care, to perform well over the long-term. Nickel-Metal Hydride Batteries: Nickel-metal hydride (NiMh) batteries typically offer higher energy density than NiCd. They are less harmful to the environment than NiCd and are less prone to memory effects. Some drawbacks are that they are trickier to charge, more delicate than NiCd and they also suffer from high self-discharge (battery loses charge at a fast rate during storage). Lithium-Ion Batteries: Li-ion ebike batteries are by far the most popular battery type used in E-bikes supplied to the Western Markets in recent years. Li-Ion have a long life and offer higher energy-density (than Lead Acid, NiCd or NiMh). Whilst Li-Ion costs are typically higher than other types, their high cycle count and low-maintenance reduces their cost per cycle over many other chemistries. Li-Ion batteries require a protection circuit to protect the cells and avoid any dangerous situations. The capacity of your battery may be stated in Ah, but to know the total energy of your battery and estimate the range, you need to also know the voltage and therefore the watt-hours (Whrs). The energy required to cover 1km, or 1 mile will vary hugely, depending upon the speed at which you travel, the terrain (up-hill, down-hill or flat), the total weight of bike/rider, how much or how little pedaling effort the rider applies, the direction and speed of the wind and numerous other effects will all affect the energy required to cover a given distance. The figure could be as low as 5Whr/km or more than 25Whrs/km, or more, under different circumstances. The power output of the battery is the ability of the battery to maintain the battery voltage whilst delivering the stated discharge current and to do this, for an extended time, without overheating and without incurring any damage. You would hope and expect that a complete e-bike would come fitted with a suitably rated battery and that is generally the case. If you are combining a battery with a DIY kit, care must be taken to ensure the battery is really “up to the task” of adequately powering that kit, under all circumstances and usage. The important points you need to understand, is the max input current on the motor controller as well as the rated power. Battery cells are rated by their C-rate, which is the ability of the cell to deliver their total capacity quickly and therefore to deliver higher power. The higher the C-rate, the better the cell can deliver high discharge currents. Unfortunately, battery cells are a generally a compromise. The cells with the highest capacity are not able to deliver the highest power and those with the highest power, may not offer the highest capacity. It is therefore important to carefully consider the power requirements of the system and choose the battery with not only the maximum capacity in mind, but also the ability of the battery to deliver the maximum power requirements under all circumstances. It is quite common for some leading suppliers to suggest that a relatively small, high Energy Battery, built with high energy cells, is suitable for even the power motor kits, with 25, 30A or more discharge requirements. Unfortunately, these relatively small, high capacity batteries simply are not a good match and in such cases, a lower capacity, but higher power battery, would be a better choice. Whilst initially, the high-energy battery, may appear to function adequately, they will if used hard, tend to degrade more quickly than a more suitably rated battery and the battery voltage will sag more under normal usage (battery voltage will drop when loaded). Another ploy that is used by some suppliers, is to state the supposedly high current handling capabilities of the BMS used and suggest that this somehow means the battery can therefore deliver these higher currents. 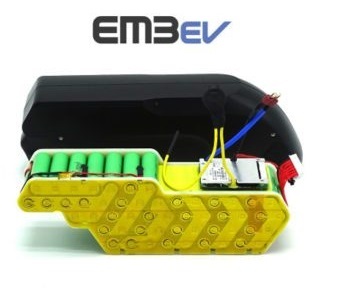 Here are EM3ev, we always rate our batteries conservatively, to ensure that they can meet the requirements of the motor system they are used with (this means suggested usage is less than the theoretical max discharge rate that is suggested by the cell maker). Therefore, you will see that we do not offer some battery options with some kits and recommend 1 version, over another. We want our customers to have a suitable combination of components, to ensure a long service life and for the kits to work flawlessly.